Drawing on the talents of the arts community at the University of California, the largest technology institute on the UC San Diego campus is launching an open call for proposals from UC faculty, graduate students, artists and researchers who want to stage performances on the cutting edge of digitally-mediated or enhanced music, visual arts, theatre and/or dance. The California Institute for Telecommunications and Information Technology (Calit2) today invited proposals to its newly-established Initiative for Digital Exploration of Arts and Sciences (IDEAS). The initiative aims to encourage all types of artists and technologists to take advantage of Calit2’s advanced audio-visual facilities, services and personnel in staging new or existing works in its headquarters building at UC San Diego, Atkinson Hall. The initial Call for Proposals seeks submissions for in-kind support from Calit2 for performances or other artistic events to be staged in or around Atkinson Hall between April 1 and June 30, 2013. Proposals must be submitted no later than noon Pacific time on Monday, February 25. A second IDEAS Call for Proposals is expected to go out in early summer for performances to take place during the 2013-’14 academic year. A number of events are planned for the inaugural IDEAS season, with onsite residencies lasting from a single day to a full week, depending on project scope. In general, organizers expect to award support for three major events that could move into Atkinson Hall for a period of five to seven days, including one or more public performances in that period. Three awards will go to events that require up to three days of rehearsal and performance time, and three other IDEAS in-kind grants will support performances that can be staged in a single day. It is anticipated that the longer residencies will feature new works, while the one-day awards may involve re-staging of a previously performed work. Preference will be given to multidisciplinary submissions from individuals or groups who would make the best use of Calit2’s unique combination of visual and audio technologies, and with its internal and external spaces for performances. These include: the 200-seat Calit2 Auditorium, which is equipped with a 12.1 Meyer surround sound system and 4K projection (offering four times the resolution of HD-TV); the 100-seat Calit2 Theater (a “black box” space with a large Vroom display wall and reconfigurable seating); the Performative Computing Lab (for advanced motioncapture to integrate the human body into digital space); Spatialized Audio Lab; as well as internal and external public spaces that range from the courtyard surrounding the 185-ton granite “Bear” statue in front of Atkinson Hall, to its Zen-like rock garden in back. Events could also use the StarCAVE virtual-reality environment and other spaces. 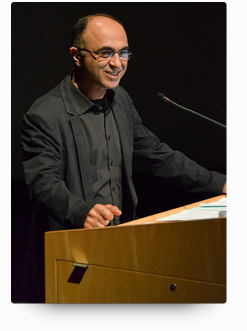 Yadegari cited the success of the recent “Crossing Boundaries” and “Arts in Action: Connected” performances in and around Atkinson Hall as an example of how Calit2 uses technology to bridge the gap between arts and sciences in a way that advances both fields. “Crossing Boundaries” was comprised of multiple experimental interactive and performative pieces using the Theater's Vroom display and highly advanced sound and lighting equipment. “Arts in Action: Connected” was a two-night event, including music, dancing, folklore, and video displays, with more than two dozen performers dancing in Atkinson Hall’s stairways and courtyard. “We are hoping to get proposals that similarly combine diverse elements from the performing arts and technology, with Atkinson Hall serving as the backdrop for these interactive presentations,” added Yadegari. Calit2 also makes it possible for UCSD faculty and students to propose telematic performances that could occur simultaneously in Atkinson Hall and at a remote location on campus, at Calit2’s UC Irvine division, or elsewhere. However, the IDEAS program will only provide in-kind support for work to be done in San Diego – so principal investigators on telematics proposals are advised to seek external support beforehand for activities at remote locations. Detailed information and rules for submissions are contained in the Call for Proposals, now available on the Initiative for Digital Exploration of Arts and Sciences website at http://ideas.calit2.net. Proposals must be submitted in PDF format and be no longer than three pages, including images. They will be judged on the quality of the submission, the proposed impact of the critical engagement, the extent to which the work best uses Calit2’s unique spaces and audio-visual technologies, the multidisciplinary nature of the proposed work, and its relevance in advancing IDEAS’ central mission of digital exploration at the intersection of arts and sciences. All proposals must be submitted online through the IDEAS Online Submission Form no later than noon Pacific time on Monday, February 25, 2013. For questions about the program, contact the program manager, , at tstone@ucsd.edu.